Developing methodology and implementing operational research on treatment-seeking behaviours of migrants and other mobile populations. 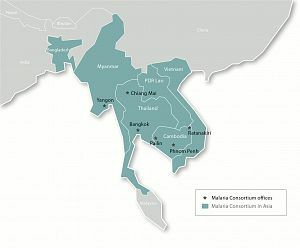 Providing technical support to the national malaria programme in the development of a strategy for malaria elimination and encouraging coordination between Cambodia and Myanmar. Contributing to the development of monitoring and evaluation guidelines and support to the national malaria programme, including field visits to project activities and providing progress reviews to all partners. Developing protocols and implementing malariometric and knowledge, attitude and practices (KAP) surveys to measure the progress of projects. Organising international and national meetings to disseminate results, identify challenges and possible solutions to bottlenecks. Strengthening the capacity of national programmes and partners to sustain progress and improve programmes based on lessons learnt. The regional office manages and coordinates Malaria Consortium Asia’s various activities to strengthen surveillance, monitoring and evaluation at country and regional levels as well as providing overall monitoring, evaluation and technical support for the artemisinin-resistance containment strategy along the Thai-Cambodian border. Contributing to the development of a Regional Action Plan for Malaria Control and Elimination in the Western Pacific along with a monitoring and evaluation framework for the GMS, while providing technical assistance to countries in the region in the development of their national strategic plans and monitoring and evaluation plans. Along with partners, contributing to the development of a regional indicator framework from malaria control to elimination which aims to harmonise key indicators across countries in the region. Assisting countries in the development and utilisation of survey methodologies to inform countries of their progress in the control and elimination of malaria. Developing innovative methodologies for real-time reporting, such as with mobile technology, from village and health facility level to provincial and national levels for decision making. Developing a monitoring and evaluation curriculum to train a cadre of country level professionals and supporting ACT Malaria training. Malaria Consortium developed and led a regional training workshop on monitoring and evaluation and is assisting countries in the GMS in developing and implementing curricula at the national and provincial levels. Developing malaria epidemiological bulletins at national and regional levels for decision making and sharing information. Conducting regional inventory of monitoring and evaluation and operations research capacity, including the organisation of a regional symposium to set operations research priorities in the GMS. Conducting operational research to improve delivery of malaria interventions for at-risk populations, including migrant farm workers and ethnic minorities. Malaria Consortium has collaborated in a qualitative study on health-seeking behaviours of migrant communities in western Thailand, as well as a respondent-driven sampling study to reach highly mobile and hard-to-reach populations. Malaria Consortium has been working to fight dengue in Cambodia, Myanmar and Thailand by seeking to build on existing community health worker knowledge of malaria, and training workers to recognise symptoms of dengue and manage cases. We also aim to build awareness of the differing vector habits when it comes to dengue transmission in order to strengthen preventive behaviours. We are also focusing on operational research for innovative and cost-effective control methods that will reduce the prevalence of dengue infection. The positive deviance approach has been implemented at the community level to help build the capacity of village health workers and volunteers in maintaining control efforts. To stop the spread of this disease, proactive measures such as these should be encouraged before the problem grows more unmanageable. We work throughout the Greater Mekong Subregion to strengthen the ability of communities and health systems to prevent the spread of vector-borne diseases like malaria and dengue. We are exploring a number of possible vector control methods, including research on insecticide treated clothing. We also help people change their behaviours in order to protect themselves against vectors that bite at night (or, in the case of dengue, during the day). Lastly, we support ministries of health and the private sector to provide sustainable channels of distribution for long lasting insecticide treated nets and encourage their use within communities. Much of our work in Asia – like our work in Africa – focuses on strengthening health systems at the national, regional and community levels. By improving capacity of health workers at health facilities and in communities, they are better able to recognise, prevent and report cases of malaria and other diseases. Our integrated community case management (iCCM) work in Asia focuses on addressing the biggest killers of children under five – pneumonia, diarrhoea and malaria. iCCM is a proven method of expanding healthcare in hard-to-reach areas, by training community health workers to provide a range of services, such as diagnosis, treatment and referral of cases. Malaria Consortium excels in specialist, cutting-edge operational research. As a result, we produce regular learning papers, posters and presentations covering issues from malaria to neglected tropical diseases. We provide policy briefs and recommendations to national programmes on how to improve malaria control and elimination efforts. We also organise cross-border meetings with neighbouring countries as part of a coordinated response to drug resistance. Finding the most effective tool for pneumonia diagnosis in children in community healthcare settings.